A seasoned mixture that may consist of a variety of seasonings such as coarse or flaked salt (sea salt and kosher salt are common), pepper or peppercorns, sage, allspice, thyme, garlic, cardamom, lavender, juniper, citrus zest, and other selected ingredients. The process of "brining" or soaking food in a liquid solution consisting of water, salt, sugar, enhanced with herbs and spices is a method often used to preserve, tenderize or flavor various food and cuts of foods. Foods are typically placed in brines so they can be cured or pickled preserved to extend the shelf life of foods such as meat, fish and vegetables. When foods are brined to add moisture to the muscle fibers within the food the brine helps to dissolve the proteins in the fibers so they become liquid instead of solid in mass. 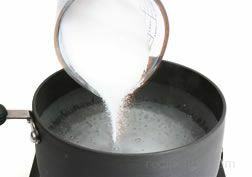 As the food soaks, the salt, which may also contain seasonings and spices, penetrates into the meat fibers. This allows any flavored seasonings or spices placed in the liquid brine to be drawn in as well, thus enhancing the quality of the food being brined. The time required for brining should be considered, since over brining will dry out and affect the meat, giving it a very salty and undesirable flavor. For smaller meats such as pork, shrimp or fish, brine for only 20 to 40 minutes, depending on size. For larger items, such as turkey, geese or large roasts and cuts of meat, brine for 6 to 24 hours depending on size. A standard guide is to brine the food item for one hour (1:00) to one hour fifteen minutes (1:15) per pound. When using a Brining Spice, add 3/4 cup of Brining Spice and 1/2 cup of brown sugar to 1 gallon of water. Bring the ingredients to a boil and allow the solution to simmer for 5 minutes. Remove the solution from the heat and place in an area where it can cool to room temperature. It is then ready to be used as a brine. Foods such as chicken, pork, turkey, fish, and shrimp, which are considered lean meats, are good foods to brine. However, before brining it is always wise to check to see if the food has been "pre-basted" with a marinade or brined seasoning. As an example turkey, pork or beef processed by major manufacturers and food processors is often pre-basted with a flavor enhancer or moisturizing agent that may affect the value of brining again. 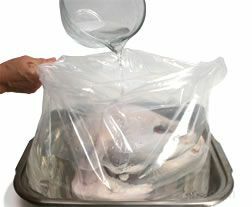 Brining a pre-basted meat often results in overly soggy meat, since too much moisture could be added by brining.